The NPA attacks on three mining facilities in Surigao del Norte could have been avoided had there been a military presence in the area, a province known to be with NPA rebels. 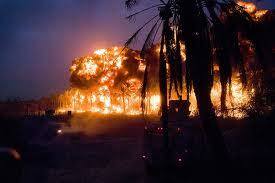 It was reported that P3B worth of equipment and infrastructure were destroyed. The NPA rebels took an entire half day, with no one to prevent them, to carry out the destruction and burning of dump trucks, backhoes, bulldozers, barges and other equipment as they held about 2,000 employees hostage and carted away whatever they saw was of some value. That’s how far the nearest AFP battalion, division or brigade was from the area. Three Billion Pesos is a lot of money to lose in one afternoon even for giant Sumitomo of Japan, a joint venture partner of Nickel Asia Philippines, owners of the mining concern. Fortunately, no one was killed but others that would have wanted to do business here might think of not being as lucky next time this sort of thing happens again. More than what was lost in the raid is the incalculable loss in business opportunities by way of Direct Foreign Investments that our country desperately needs. Knowing the huge amount of capital invested in their operations, why did anyone not think of providing safeguards in protecting these expensive equipment, not to mention lives? Whose responsibility is it among the government departments, agencies, or bureaus to protect not only the companies engaged in mining but the mines themselves? Is it the Mines and Geosciences Bureau, the DENR, the AFP or all three in coordination? If we want to lure other foreign investors to come in and do business here, we have to show them that there are people that will have to be answerable to this latest rebel attack that has made obvious the lack of “intelligence information” on the part of our military. A couple of hundred rebels in an area should not be easy to hide from our armed forces if they were heads-up in their intelligence gathering against the NPA. The first order of battle in any war is knowing where your enemy is. Instead of acquiring antiquated naval battle ships that don’t make the slightest difference in our naval strength in comparison with the navies of our perceived or imagined enemies, like China over the Spratly islands for instance, we must focus instead, once and for all, in destroying the NPA that is “already” within our territory and will never give up their violent “struggle” if the last half century has taught us anything. We’ve heard P-Noy say more than once that he is not in favor of Charter change or even amending some economic provisions in the Constitution; and as an economist, he must have his reasons for thinking so. What’s curious is why none in his economic team are explaining in detail to business leaders why this is, indeed, not going to be of help in growing the economy, as their boss has opined. The question that begs to be asked is: are P-Noy and his economic appointees in agreement on this issue? The silence of his economic managers on the merits of amending economic provisions in the Constitution is getting more and more deafening.